High levels of Customer Engagement earn CHROME Federal Credit Union a place in NBRI’s Circle of Excellence. The National Business Research Institute (NBRI) is pleased to welcome CHROME Federal Credit Union to the NBRI Circle of Excellence. The NBRI Circle of Excellence Award recognizes organizations that place a high value on Employee and Customer engagement. These organizations demonstrate their dedication by conducting best in class survey research with NBRI and taking action based upon the results. NBRI commends the leadership of these organizations for their commitment to the Continuous Improvement Process and recognizes their achievements with the Circle of Excellence Award. To qualify for this honor, the organization must score at or above Stretch Performance at the 7 benchmarking percentile when measured against their industry, or the organization must improve 5 or more benchmarking percentiles in total company score over the previous research study, a statistically significant amount. It is no small feat to move an entire company’s score of customer loyalty or employee engagement 5 or more percentiles, or to reach Stretch or Best in Class Performance levels. CHROME Federal Credit Union may appear to be a shiny new credit union, but our history in the Greater Pittsburgh area goes back decades. So, here’s our story. The employees of Washington Steel Corporation founded a member-owned financial cooperative, Washington Steel Federal Credit Union in 1971, which later expanded to serve all individuals who live, work, worship, attend school or volunteer in the Southwestern Pennsylvania community - including Allegheny, Armstrong, Beaver, Butler, Fayette, Greene, Indiana, Lawrence, Washington and Westmoreland counties. Our people always cared about helping our neighbors and small businesses save, responsibly borrow, and live better. But we knew we could do more by modernizing our identity, simplifying our products, and letting our humanity shine. Chrome is a metal that can be stretched and pounded, but will never break. Chromium is added to steel to make shiny, strong, stainless steel. Likewise, CHROME Federal Credit Union offers banking that shines in a strong, stainless, and simple way. Our job does not get in the way of getting to know you or delivering more than a member expects. We look for ways to commit random acts of kindness. And if you’re having “one of those days”, we’ll work really hard to turn it around and make it excellent. CHROME Federal Credit Union is more than just a bank. We invest in WOW moments. NBRI conducts Employee, Customer, and Market Research for businesses, and uses this data to help organizations leverage these human factors to make improvements to operations and strategy. With its extensive experience across all industries, NBRI’s research teams bring their clients a combination of deep industry knowledge and expert advice. NBRI’s mission is to help their Clients set new standards of excellence in their industries. NBRI product offerings, such as the Root Cause Analysis, ensures their clients will focus on the most impactful issues. CHROME is spreading lots of cheer this holiday season with a special offer even Scrooge can’t pass up! Every time you use your CHROME Visa® Platinum or CHROME Visa® Signature Credit Card from December 15 - January 15, you’ll get 3% cash back every purchase. Yep, we mean EVERYTHING! So that mega flat-screen, new Nintendo Switch or cool smartphone that’s on your shopping list just put money back in your pocket. Round-trip airfare to Nana’s house is easy-peasy. A trunk full of toys for good girls and boys won’t break the bank. Whether it’s cold beers and a sandwich at Primanti Bros, gliding around the ice rink at PPG Place, tickets to The Nutcracker, or something sparkly for your soulmate, everything you purchase in-store, online or out-and-about with your CHROME Visa puts money right back in your pocket. Plus, you’ll enjoy a super-sized holiday with a full 30 days to take advantage of the savings! Don’t have a CHROME Visa Platinum or Signature Credit Card? It's easy to apply. Both cards offer great low rates, no annual fee, and enhanced security features with Visa chip technology. With CHROME 24’s online access you can activate your card, view statements, make a payment, transfer a balance or request a credit-line increase anytime, from anywhere. Don’t wait! From December 15 - January 15, a touch of orange makes the holidays merrier. Enjoy the season and spread the joy with your CHROME Visa Platinum and CHROME Visa Signature Credit Cards. Happy holidays from your friends at CHROME! Sometimes — especially with everything going on in the world — it’s easy to forget that humanity has survived for eons because we’ve always found ways to pull together. Community is our glue. It has carried us through good times and bad. Together, we are always stronger. When people work together and build on small kindnesses, “wow” moments happen. Good energy pushes out sadness, worry, stress and zillion other ills. We’ve seen it happen—lots. Not long ago, we were touched when a CHROME member told us about her neighbors. Melissa shared the story with CHROME’s leadership team and got the funds to buy a new iPad. That afternoon she sent it to the little boy. “He sent me a great card and picture saying, ‘Thank you so much. I get to talk to my dad now.’ I literally broke down in tears,” she says. The experience wowed Melissa just as much as it did the little boy and his mom. Or help keep a little boy and his dad close even though they’re half a world away from each other. Wow is pretty wonderful. CHROME is honored to have helped local brewer and winery owner, John Burgess, make his expansion dreams come true. If you have a credit report, there’s a good chance that you’re one of the 143 million American consumers whose sensitive personal information was exposed in a data breach at Equifax, one of the nation’s three major credit reporting agencies. Here's what you need to know. If your account is hacked, you don’t have to feel like a victim twice. Learning that money has been stolen from your bank account is unnerving. Lots of questions flash through your mind: How did this happen? Who did it? Will I get my money back? How can I make sure it doesn’t happen again? You certainly want your bank to be on top of the situation, not make you feel even more vulnerable. A swath of folks from Western Allegheny to Beaver County recently learned their accounts had been hacked over a weekend. Officials think the fraudulent withdrawals may have been made using a skimmer installed in the financial institution’s ATMs or at a retail location like gas stations, but they weren’t really sure. In fact, they didn’t know if 15 or 150 customers were affected. Often, in these situations, the biggest disappointment is the way the credit union or bank treats these customers. The fraud victims usually have to go a bank branch, fill out paperwork, and jump through other hoops. Plus, it can take more than a week to get the stolen funds returned to victim’s accounts. Not good when you consider the ripple effect an unexpected empty bank account can cause. I think it’s fair to say the whole experience probably makes them think very differently about their credit union—and not in a good way! At CHROME, we are proactive advocates for you—no matter what happens. That’s why we’ve invented CHROME Confidence—fast, responsive, unconditional support to protect your money, resolve the situation if something goes wrong, and give you peace of mind. The first thing you should know is that we use a lot of smart, state-of-art tools to rigorously monitor fraud and stop it before it happens. But if a hacker or skimmer should breach your account, we have an action plan in place to make the situation right—fast. We don’t leave you in a lurch. If you need to make a purchase or stop by to withdrawal money from an ATM before we deactivate your card, we’ll wait for you to complete your transaction before doing so. Other banks have no problem shutting things down right away and leaving you stranded with no funds. We prepare the necessary forms and email them to you. While most credit unions and banks make you come to a branch office and sign lots of forms in person, we make it easy. Simply sign the forms electronically using your smartphone or tablet and email them back to us. If you don’t have access to the Internet, no worries. We’ll prepare all the forms in advance so they’re ready for your signature when you come to a CHROME store. We credit your account right away. Once we have your signed forms, the stolen funds will be returned to your account before the end of the day. And it doesn’t matter if the theft takes place over the weekend or on a holiday—we’ll take care of it! Returning your money as quickly as possible is the most important thing to us. We replace your debit or credit card ASAP. We will even expedite your new card at no charge if you need it sooner than the usual delivery time. We make sure you’re completely happy. We check in with you to make sure you received your new card, and that the fraud is completely resolved to your satisfaction. So don’t worry! CHROME on. Learn more about all the benefits of CHROME Confidence. Higher interest rates on your savings! Finally, after years of lackluster rates that delivered barely-there returns, interest rates are finally heading north. And experts expect the upward trend to continue so, if you’ve been parking money on the sidelines, now’s a good time to jump back in — whether you prefer savings and individual retirement accounts (IRAs), money market accounts or certificates. Yes, interest rates have gone up. That doesn’t mean all banks or credit unions are offering the same higher rate or even offering higher rates. You’ll be rewarded for shopping around — even if it means leaving the corner bank you’ve had an account with since you were a kid stocking away your babysitting or lawn-mowing money. Same goes with blind loyalty to the big banks. They rarely offer the best interest rates on savings accounts. You’re more likely to find better rates at smaller, more community-focused banks and credit unions. CHROME offers some of the highest interest rates available and is consistently ranked in the Top 3 for highest rates offered in the Pittsburgh area. What does an increased deposit rate do for you? Every dollar you deposit into your savings account earns more interest and helps your savings grow faster. All CHROME accounts earn interest that are compounded and credited monthly. What does that mean? Interest is also added to the principal amount, which allows your interest to earn interest – helping you make more money over time. You’ll get unlimited deposits and ATM withdrawals, but there is a limit on your additional transactions. What is considered additional? There is a federal law that limits certain types of telephone, check and electronic transfers. Those include: debit-card transactions, online and mobile transfers and more. Those big blocks of tiny type definitely look intimidating — that’s why a lot of people don’t read them. Do yourself a favor; don’t be one of them. Make sure there aren’t any unexpected surprises tucked into the terms, conditions and disclaimers at the bottom of the bank paperwork. For example, does it cost money to open the account? Do you have to keep a minimum balance in the account to receive the higher interest rate? Is there a monthly service fee? Hidden costs like these can wipe out any monthly gains your savings is supposed to generate. Ready to make more money with your money? CHROME can help. Here’s how you can lock them out. You might be sleeping or taking your dog for a walk. You could be at work, at your kid’s soccer game or meeting friends for dinner. Life is good, right? You have no idea that hackers around the corner or half a world away are doing their darndest to steal your personal info. And, once they have it, they could clean out your bank account or go on an online shopping spree with your credit card. More than 15 million Americans had account information stolen last year. Yes, 2016 was a very lucrative year for cyber criminals. Despite fierce security measures, they made off with $16 billion dollars — nearly a billion dollars more than their 2015 haul, according to the 2017 Identify Fraud Study by Javelin Strategy & Research. They’re also opening new credit accounts using stolen information (name, date of birth, mother’s maiden name and Social Security number) and having a new card sent to them so they can spend away. No wonder consumers worry about the security of their personal info. Choose the right banking partner — one that will stand by you. 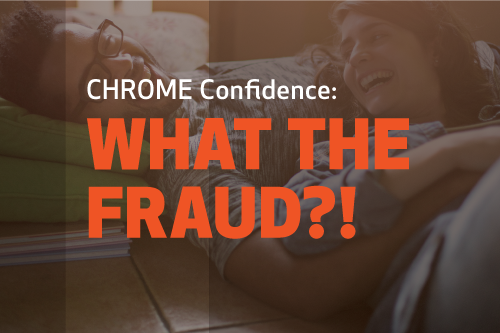 When you bank with CHROME, you are backed by CHROME Confidence — our unconditional guarantee that you are NEVER responsible for any unauthorized online or mobile-banking transactions. All you have to do is notify us of any unauthorized transaction within 60 days, and we’ll help you take care of the rest. It’s that simple. Look for a bank that is up to speed on the newest security measures and threats. Cyber criminals are persistent, but CHROME is always working, updating and implementing new ways to keep your transactions and personal data safe and secure. Our approach to protecting your account includes anti-virus and anti-malware protection, firewalls, advanced encryption and multi-factor authentication. Each step is in place to keep your account better protected and give you peace of mind. Find a bank that is fearless when it comes to protecting your privacy. We never share your username or password with anyone. We also keep prying eyes from seeing or gaining access to your personal information with automatic logout when a period of inactivity is detected. And we don’t just wait for the cyber criminals to show up. We monitor online account activity for potential fraud and routinely review websites, app providers, and other online resources to sniff out phishing schemes, bogus apps and malware that can put your account info and personal data at risk. With CHROME Confidence, you can enjoy all of the convenience of online banking and shopping without the worry.